This beautiful home is steps away from the beach and offers lots of deck space and private pool. Enjoy the views from the decks of this beautiful home. A one-block walk directly south from the driveway of 500 Maldonado brings you to the pristine white sands of Pensacola Beach. 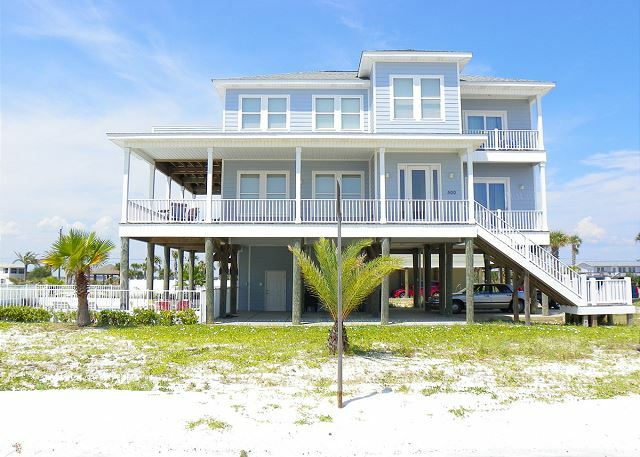 This home has decks on both the main level and top floor offering views of both the beach and the Sound. The main level of this home includes the living room, dining room, kitchen and half bath; king master suite and master bath. This level of the home has a wrap around deck on the south and west facing sides of the home. The top floor of the home has an second king master suite with master bath, two additional queen bedrooms with Jack-and-Jill bath, a secondary living area with sleep sofa, and a large sun deck off of the west end of the home. There is a ground level private pool located on the west side of the home. The driveway and area under the home offers parking for eight plus vehicles. 500 Maldonado was just as listed. Nice rooms with decent furnishings, just as pictured. The home has ample space to eat, laugh, and visit with friends. The 3rd floor rooms are nice and tucked away so you dont hear the fun going on in the living/kitchen if you wanted to escape. Added little bonus, lounge room on the 3rd floor was nice too. The pool was a great added feature on days when you want to take a break from the sand. We really had a great stay! Thank you so much for posting your review! We're so happy to hear that you had a wonderful stay at 500 Maldonado Drive. We hope you come back to see us again very soon! Stayed with the family in June. The house is well maintained. Pool furniture updated. Just a few steps from the beach. Beautiful views. No issues with anything in the house. No ironing board (weird). Thank you for posting your review. We're so glad you enjoyed your vacation at 500 Maldonado! Our properties supply ironing boards so we will certainly have one put back into the property. We appreciate your feedback and look forward to your return! We are so glad you enjoyed your stay with Paradise Beach Homes! We hope you return soon! This is our fourth year staying at this property and we couldnt be happier. The property is well maintained and has a great kitchen and gas grill for cooking! We love this house so much weve already rebooked for next year!! Thank you for taking time to post your review. We appreciate the return business and we are so glad that you enjoyed your stay at 500 Maldonado. We look forward to seeing you next year! Very nice home right by a beautiful beach, home is very nice with a pool and lots of things to do near by. The home does need a couple of updates like outside furniture chairs by pool were dry rotted lots were broken. Also no lights by pool and lights in garage parking did not work so it was dark by pool so no swimming after sun went down. Overall home was very nice and we hope will stay there again soon. Thank you for your review. We are glad to hear you enjoyed your stay at 500 Maldonado, we will make sure the furniture and pool light issues are addressed. We look forward to seeing you again on your next trip to Pensacola Beach! Nice location with lots of room but in need of renovation. Carpet needs to be replaced, the pool was a nice addition but the filter was not working so it was dirty. Swinging Patio doors need to be replaced as they have not been maintained and the edges are swollen making them hard to close. This was a great way to bring my family together for the holidays. I live in Texas and their from Tennessee so it was a great location to meet for a wonderful vacation. We really enjoyed the beauty if the home and the location. We will definitely come back this summer so we can enjoy the beach. We we're able to walk 2-3 minutes to the beach. It was so beautiful. The kids really enjoyed collecting shells. We we're all very impressed with the wholesome details of the home. It has everything you'd need from the can opener to soap and washing powder. You will need more of course depending on your stay. We will definitely, 100% be back this coming up summer. Perfect location, steps from the beach. Nice pool and plenty of space to accommodate 10 adults. Very happy w/ our rental this Summer. House was very clean and everything we used worked great. The only minor issue we had were there were lots of broken shelves in the fridge. I assume it was due to normal wear and tear so it was a minor issue. The house was very nice and we would definitely stay there again. Loved being close to the beach and also having a pool! Great views! Very relaxing and fun vacation! There were a few things that would have made the stay even better! Most of the outdoor furniture was broken and the rest was very uncomfortable. The shelves and drawers in the refrigerator were broken or cracked. Would have loved to have had some hooks and mirrors in the bedrooms! But overall the place was great and can't wait to come again!! This is a beautiful home with lots of space for a large family or multiple families. You could see water from both side of the house and the beach was an easy walk. The rooms were very comfortable and having a pool onsite was also a plus. Would definitely recommend this home. enjoyed our stay the location was great the weather was great and loved the white sand. The customer service was good the house keeping was not as good as expected had a problem with roaches. After house keeping and bug problem fixed would recommend this property. We enjoyed the dolphin cruise and shopping as well as the white sand beach. Great house and accurately described. Plenty of room for the 9 of us. Close to the beach which is great in the heat. Pool was big and very nice. Plenty of furniture inside and out. Plenty of room and close to the beach....and Oh, that Pool. A short one block walk to the gulf beach, two blocks to the Sound. Quiet area away from the hubbub of the Board Walk and public beach area. Plenty of interior room for privacy. Pool was great. It was cleaned and checked mi-week. The TV's only had 2 channels in the bedrooms. You also need a skimmer for the pool. We had a dead lizard and a lot of bugs that we really needed to get out of the pool. Also, we had 4 coolers stolen. Overall, our stay was great. Just those 2 minor inconveniences. * Missing basics like...sugar. Do we really need to go to the store and buy sugar? * Two beach chairs - you should have several. it's a beach house. * No source of music - it doesn't have to be expensive but having nothing at all is sad. * 5pm check-in / 10am check 's a little late and a little early. If you make check -in at 2pm you basically get a reasonable day in for Day 1. We've stayed at other places in Pensacola with much more reasonable check-in/check-out times. For the money being charged for this property, you essentially make it less of a value stay. * Clean-up expectations...asking guests to wash and put back all the kitchen items in their originally place is a little onerous. You are charging a $250 clean up fee for what is essentially a 2 days stay. That's a LOT i you are requiring guests to essentially leave it in the same condition it was in when arrived. Seems like $250 for making beds and vacuuming the floors. Great property close to all amenities and beach! We had a great experience. The home was very nice & clean & spacious. Perfect location. Wow! What a beautiful home! We enjoyed our vacation "home-away-from-home" so much, and would highly recommend your company! We hope to come back again! Also, your staff was so courteous and helpful! Thank you! We thoroughly enjoyed our stay at 500 Maldanado. The location was perfect and the house was very nice. We had an excellent stay and I would recommend this house to others. By far the best family vacation ever. We plan to do this annually. Views were great, as well as location. Plenty of room and extras for the grand children to be entertained. Lower AC unit didn't keep up with heat but I know it was unusually hot this year. This home worked very well for my children and grandchildren. The 2 master suites were a big hit for my children and spouses while the grandchildren loved the pool. The view of both the sound and the Gulf from any of the decks was awesome. Your agency promptly provided a gas grill which we needed. The house and location were great! We spent most mornings and evenings sitting on the awesome deck. Only issue we had was with the washing machine which was never fixed during our visit. One of my family top 5 vacations. We will be back and will rent only properties of Paradise Beach Homes. PBH met and certainly exceeded our every expectations. The stay and location were great, close to everything. The location was perfect. One block from the beach and a nice walk to the Boardwalk area for shopping and eating. When we contacted Paradise Beach Homes about a problem, they came out immediately to fix it. The house was clean but does need a good spring cleaning. But what can one expect from a rental. And maybe it is because I am compulsive when it comes to cleanliness. Others would not have a problem with it. It had everything that we needed for the week. I would recommend it to anyone. We spent 5 nights at the house for a family trip over spring break. The location was great. A very short walk to the beach. The nearby beach was clean and quiet. We found the house to be comfortable with a nice layout. There were 3 young children in our party and it was easy for them to sleep upstairs without being disturbed by noise from downstairs. Everything we needed to stay comfortably was provided. I would say that the house could have been cleaned a little more thoroughly before our arrival. It was quite dusty. Overall we really enjoyed our stay and would definately return. We were a group of 14 and the house was great! Clean, spacious and , good layout. We have rented 3 other houses in the area and this was one of the best for yr group. We stayed in this house in 2011 and promised to return. It's the perfect location. You have an unobstructed view of both the Gulf and the Bay. There's a trolly stop within a matter of feet. It's large enough to accommodate my large family with two master suites (one on the main level for folks who don't traverse steps well) and a jack and jill style bathroom and bedrooms. It also has an additional living room for the teenagers to stake claim. It is starting to show it's age though. The AC is starting to have difficulty keeping up. One of the front windows is rotting through from the porch above it. We had to put a towel in the window to keep it from pouring on the floor. The only real negative is the Wifi was AWFUL! We all got data notices from our providers because of the poor wifi connection. Also, note that there is a new build next door. So, it wasn't quite a peaceful as the stay before But, we'd definitely stay again. There were several issues in this home. One shower did not work and we had to request someone be sent to repair that. Dishwasher was full of dirty dishes. Very minimally stocked. One toilet paper roll in each bathroom? Not realistic! We supplied clothes laundry soap, bath soaps, and hand soaps, bottled water, toilet paper, paper towels and more. For the rental price, there should be more amenities provided. Please include my name, Courtney Winstead as reviewer. I worked with the rental agency. My spouse, James, did not.